MusicArt – Home | musicart.com.au | Suzuki Violin and Viola lessons in Brisbane. and you're telling a story. 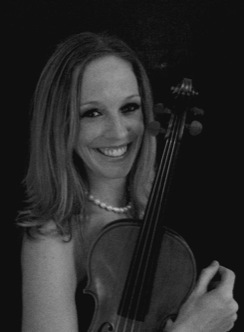 I am a Suzuki Method violin and viola teacher with 20 years teaching experience. Originally from Utah, I started my teaching career in Seattle, Washington, where I was the Director of The Suzuki Academy at Music Center of the Northwest. I moved to Brisbane in 2009 to be with my Australian husband. I teach private lessons for violin and viola at my home on weekdays from 3pm until 7pm, to students from age 4 up to adults. Please feel free to review the testimonials written by some of the parents of my students, or peruse some photos and videos of me teaching my students. The studio is currently full and I have a waiting list and I’m happy to add your child (or you) to the list. Feel free to email me or call me for details. Specializing in teaching the Suzuki method, I love to help violin and viola students discover and express their uniqueness as individuals. I provide a structured, yet nurturing environment that promotes building a strong foundation of excellent technique and musicianship. Students then thrive while developing self-motivation through mastering small steps, participating in group classes, and performing in studio recitals. As the youngest in a large musical family, I began my formal musical training at age five when I started piano lessons. Influenced by my two older sisters who played the violin, I was determined to also play. Finally, after begging and prodding my parents, I started violin lessons at age eight, and I took piano and violin simultaneously for a number of years. 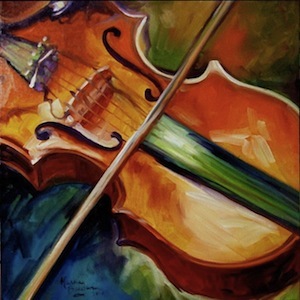 Pursuing violin as my primary instrument in high school, I was a two-time winner of the Orchestra of Southern Utah Concerto Competition and won Superior ratings at the Utah State Solo and Ensemble Competitions. I went on to study violin in Munich, Germany with Stephan Kirlpal during my senior year in high school as a Rotary International exchange student. I was the concertmaster of the Southern Utah University Symphony during my first three years at university, and I was also a featured soloist as the SUU Concerto Competition winner. 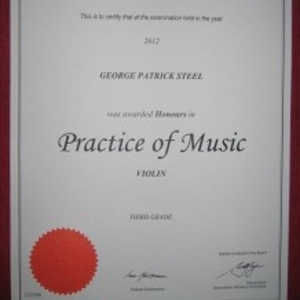 I attended the prestigious Meadowmount School of Music in New York, where I picked up the viola. After moving to Seattle, I received a B.A. in violin performance from the University of Washington. I taught private violin lessons to put myself through university. I subsequently managed a private studio, and was also a faculty member of Music Center of the Northwest for over four years. After completing several Suzuki teaching certification and a number of years teaching Suzuki Method, I later became the director of the Suzuki Academy at Music Center of the Northwest. Aside from teaching, I’ve enjoyed performing regularly with string quartets, rock bands, and symphonies. My students have enjoyed many successes and musical experiences. Several of my students are, or have been, members of esteemed youth symphonies, including the Seattle Youth Symphony, Bellevue Youth Symphony, and Cascade Youth Symphony. Some have held positions such as concert master and section leader in these organisations. My high school students have successfully auditioned for highly competitive state-wide orchestras and competitions, including the Washington All-State Orchestra and Washington State Solo and Ensemble Competition. My students have also participated in intense summer camps and festivals every year. Hiking & Backpacking, Cooking, Traveling, Rock Climbing, Experimenting with electronic music and my looping pedal! Consistent daily practise pays off! Miriam graduated from MusicArt in 2016 and achieved her AMusA (Associate in Music, Australia is a diploma awarded by examination to outstanding candidates in the fields of musical performance and music theory by the Australian Music Examinations Board (AMEB)). 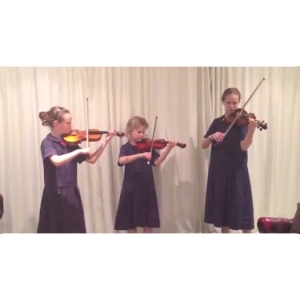 For more videos of my wonderful students, check out our video archive page. Holiday Music and Art Camp 2013! Holiday Music and Art Camp 2013! 1984 days ago. Student of the Month: Hedya Sutherland 2009 days ago. Student Successes: George Steel 2248 days ago. Busking Competition! 2586 days ago. Here are some testimonials I have received from past students and parents. I wish to thank them all for their generosity in allowing me to repost their comments from TeachStreet’s site. What will we do without you, Christine? Seattle’s loss is Brisbane’s gain. My seven year old daughter, Mia, had the privilege of Christine’s well balanced mix of technical discipline, creative fun and an infusion of passion for music. Christine is very engaging and able to introduce new ideas and techniques in ways that she knows will challenge Mia, but never overwhelm her. I think that Mia’s measure of success can be found in her enjoyment in playing the violin and in her excitement to learn more. I am lamenting that we had only a year with Christine, but I am also feeling quite fortunate to have had her for Mia’s first year! What a stellar foundation! My step-daughter began taking violin from Christine just after she turned five. I can’t say enough good things about what it has done for her education. Christine is a fun teacher and she’s incredibly productive. Our daughter can be a handful with her endless questions and boisterous energy, but Christine knows exactly how to engage her in lessons. Most of the time, she doesn’t even know she’s learning, she just thinks she’s playing games. There have been times when we’ve hit a rough spot, but Christine doesn’t let up. She encourages and teaches in different ways until something clicks. This has taught our child the invaluable lesson that hard work and practice pays off. My daughter started taking violin lessons from Christine when she was 4, and she just turned 8 today! We hope Christine will be our teacher for many years to come. She’s an excellent music teacher. Through her, my daughter is learning the importance of balancing discipline with fun. I love watching my daughter take pride in being able to play an instrument and improve with practice. We both love Christine and would recommend her to anyone. Christine Dunaway has the uncanny ability to teach the right thing at the right time. She always seems to know when my daughter Sophie is ready to move on to the next challenge. This has kept Sophie engaged in the learning process from day 1. She loves playing! Christine Dunaway has been my son Paul’s teacher since he started playing the violin three months ago. In this time, we have gotten a taste for the joys and challenges of learning an instrument, and I am continually impressed with Christine’s mastery of motivating and instructing children. She has a tangible love for the violin, and it is a contagious enthusiasm: Paul loves his lessons and this spills over into his home practices. I had previously regarded my preschooler as a very little child, unready for focused activity, and so I am surprised and pleased at the level of concentration that Christine has brought out in him. Christine turns skill development into games and is generous with her energy and praise. We are enjoying Paul’s musical journey, and we only wish that it could continue under Christine’s tutelage! Christine taught my daughter for 4 years. 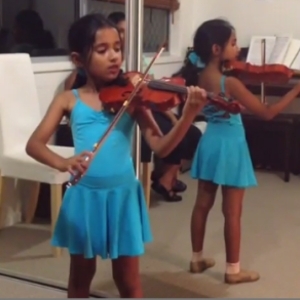 Her enthusiasm for music and especially the violin gave my daughter a renewed passion for playing. Christine’s teaching style is very unique. She uses word pictures to help students improve technique. For my daughter, this was very effective. Her playing improved quite remarkably while under Christine’s guidance. Christine not only taught the fundamentals of music, she also taught techniques of playing the violin to reduce fatigue and repetitive motion injury. She made learning fun. I would definitely recommend Christine Dunaway without hesitation. I am a fellow violin teacher, and Christine has given master classes to my students. It has been very well received and has given them a new perspective and excitement for the violin. Christine has creative ideas, and is very focused on helping them fix one technical problem at a time. Her methodical, fun approach has motivated my students greatly!